When Paul Linnebach, founder of Mantis Design + Build, Minneapolis, began working with a professional woman who wanted to renovate the master bathroom in her townhouse, the challenge was clear. To put it baldly, “She wanted a total transformation of her ugly bathroom,” Linnebach says, laughing. In particular, the huge soaking tub underneath a skylight had to go. Two questions—at once simple and challenging—guide Linnebach in every project he undertakes: “What is a client willing to do? And can we manage it?” He adds, “I’m always looking to push creative boundaries and zones outside of the norm.” With this remodel, the homeowner and the designer/builder created a glamorous yet earthy spa-like bath, glistening with golden light, alive with plants, and resplendent with luxurious details. In the end, they ditched the rarely used soaking tub in favor of a large, open shower below the skylight—creating a feature not unlike an outdoor shower. 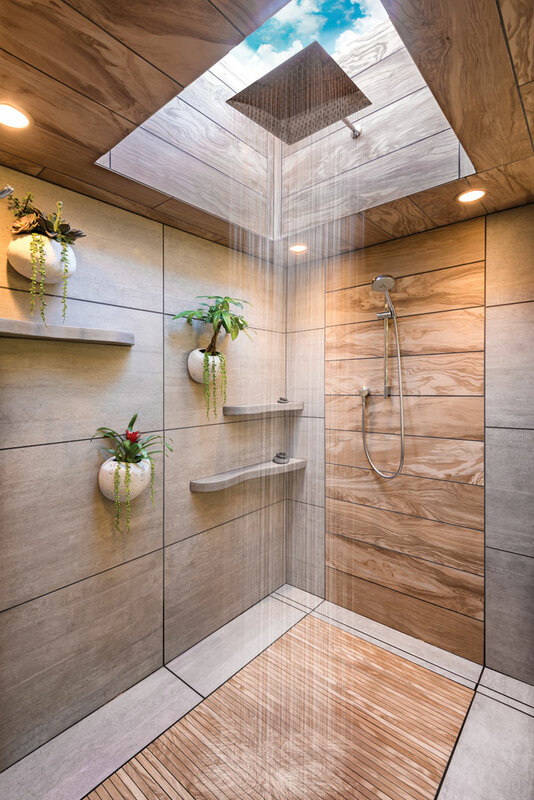 Linnebach devised a 16-inch rain shower that extends from inside the well of the skylight, adding a concealed vent and fan to prevent moisture buildup. Inside the skylight and shower, he used faux-wood accent tile (easier to maintain than wood), large-format concrete tile, and tatami-mat-like floor tile. 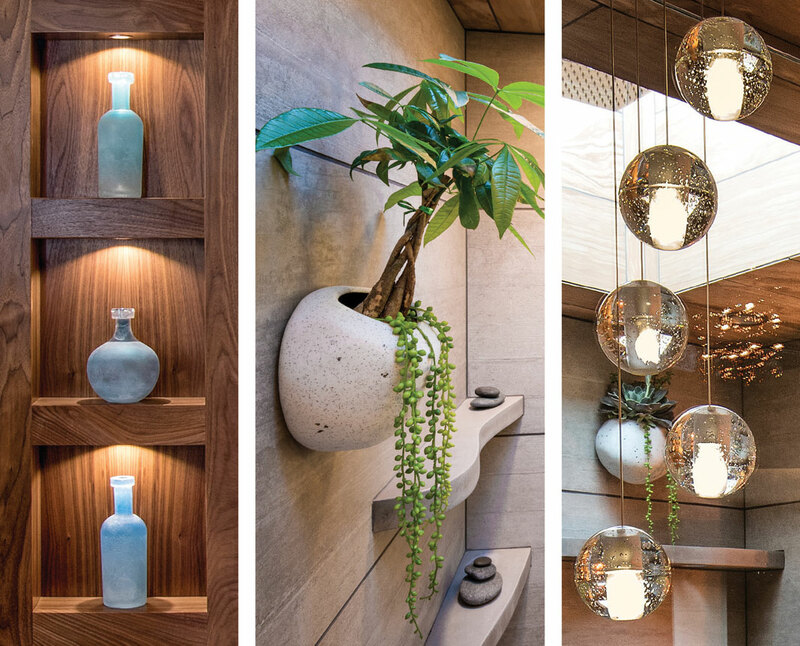 Live succulents occupy the custom porcelain wall planters created by Portland artist Julie Ashbury. Custom concrete shelves hold the homeowner’s shower products and décor items. 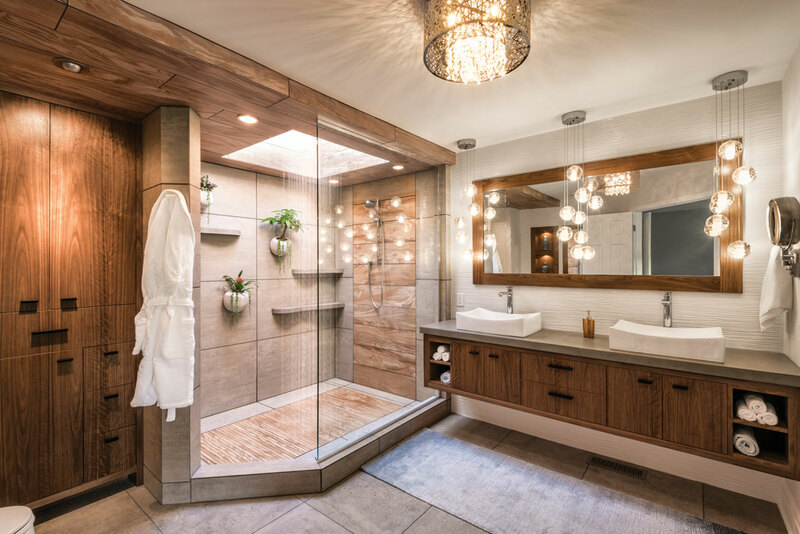 While the dramatic rain shower was a crazy, beautiful idea, says Linnebach, the Bali-like atmosphere it enhances makes this bathroom both playful and luxurious. One of his favorite “can we do that?” moments, the shower is also the homeowner’s favorite feature. The design reflects the client’s love of Asian style and takes cues from Linnebach’s own travels to Bali, where bathrooms are often connected to the outdoors to bring nature in. The bath also showcases custom-built walnut cabinetry, including the two-sink vanity with a built-in hamper and drawers, niches for décor above the commode, and a linen closet (placed where the former shower was located). The walnut mirror vanity was also custom built. Behind the vanity is a glossy-white tile backsplash with a wave-like pattern and texture. Bocci golden globe pendants sparkle above the vanity.